Summer is coming to an end – goodbye to the Pimms and floral gins in the garden, hello red wine and hot toddies in front of “must see” Autumn TV. Then… it’s Christmas. I know, I know – I went there too early. But the reality is that Christmas is just around the corner and so is the massive demand for alcoholic tipples, us Brits thrive on the stuff through December. So much so that many people feel the need to take a January detox! Whether you are in the business of distributing to restaurants and bars, fulfilling online demand or simply exchanging corporate gifts, the extra storage of bulky bottle packaging is enough to give you a headache. Traditional polystyrene bottle packs can take up a huge amount of warehouse space as it is rigid and bulky. Airsac bottle packs are packed flat and inflatable on demand, one small box of these packs can typically replace one pallet of polystyrene. Depending on your usage you can replace racks of polystyrene with one pallet of inflatable bottle packs. The storage savings are significant. This also makes it ideal for small seasonal users of bottle packaging – a pack of Airsac can be stored easily in an office cupboard and inflated using a small, cheap hand pump. Distributors can inflate large volumes quickly using a compressor or in-house air supply. 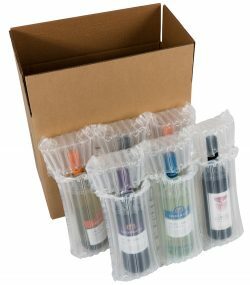 Inflatable bottle packaging is available for wine, champagne, spirits and beer – suitable for single bottle shipments right up to full case shipments. Macfarlane Packaging carry a wide range of bottle packaging, why not contact us today?